2014 Weingut Ingrid Groiss, Gruner Veltliner, Weinviertel DAC, Austria. Here’s another exceptional release from Groiss, and while 2013 remains the absolute star vintage in a generation the 2014 wines are really lovely and will not disappoint, especially this one. 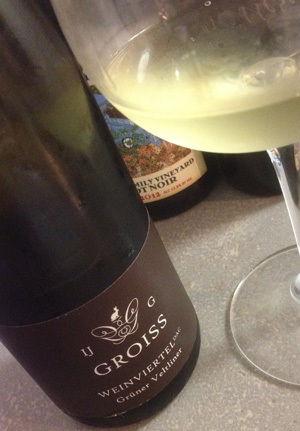 The 2014 Ingrid Groiss Guner Veltliner Weinviertel starts off earthy/cheesy, tightly wound and charmingly rustic with dusty stones, bread dough, forest floor notes and salted citrus before unfolding it’s brisk acidity and delicacy of fruit and mineral tones, it takes a while before the rush of flavors blossom, in fact I was stunned to find on day two a much more intense wine with an almost backward evolution, it shines after some air and time revealing more depth, power and extract plus it just get’s about to 2013 levels of thrill and enjoyment, even if it is slow to get there, this is very impressive stuff again from Ingrid Groiss. There is vivid lemon/lime, green melon, bitter almond, white pepper, baked clay, yeast, steely liquid mineral and zesty brine and white peach, it is more subtle at first, but this light Gruner has all the right stuffing and should prove interesting and pleasing for 3 to 5 years, it might be best to give it another 3 to 6 months if you can keep your hands off it, best from 2016 to 2020, the finish day one is crisp with wild mushroom and grapefruit, and day two there is a bit more apricot and stones. I highly recommend discovering these wines by Ingrid Groiss, the 2013’s if you can find them are mind-blowing and these new 2014’s are not far off either, her stuff is not easy to get, but well worth the search, she is my new favorite producer from Austria and a wonderful talent.